ĐÀ NẴNG — APEC ministers have adopted a number of practical initiatives on building a green economy and achieving food security through quality growth that will be presented to leaders of the 21 economies tomorrow in Đà Nẵng City. 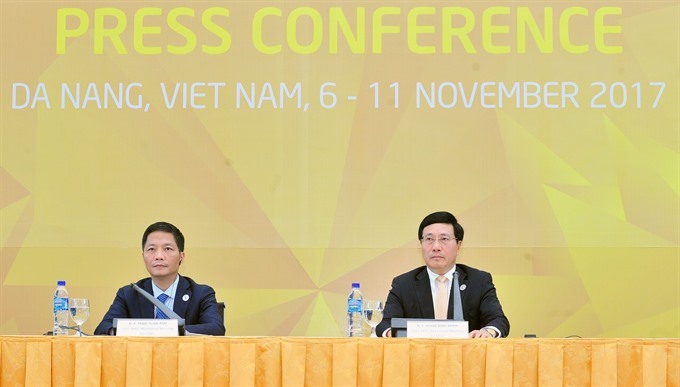 Deputy Prime Minister and Foreign Minister Phạm Bình Minh, co-chair of the 29th APEC Ministerial Meeting (AMM), also told local and foreign media on Thursday afternoon that the meeting had approved an e-commerce facilitation framework within the Asia-Pacific Economic Co-operation (APEC) bloc. Asked about the action plan for implementing the Lima Declaration on the Free Trade Area of the Asia-Pacific (FTAAP), co-chair of the 29th AMM, Minister of Industry and Trade Trần Tuấn Anh, said APEC ministers had agreed to continue discussing the work plan on advancing the pact. The 21 APEC member economies group Australia, Brunei, Canada, Chile, China, Hongkong-China, Indonesia, Japan, the Republic of Korea, Malaysia, Mexico, New Zealand, Papua New Guinea, Peru, the Philippines, Russia, Singapore, Chinese Taipei, Thailand, the United States and Việt Nam. On Thursday, the leaders of Australia, Brunei, Chile, Japan, Hongkong-China, Malaysia, Mexico, Myanmar, New Zealand and Peru arrived in Đà Nẵng to attend the most significant event of APEC 2017 – the APEC Economic Leaders’ Meeting. President Trần Đại Quang on Thursday received several foreign leaders in Đà Nẵng as they started arriving for the Asia-Pacific Economic Co-operation (APEC) Summit. Deputy Prime Minister and Minister of Foreign Affairs Phạm Bình Minh, meanwhile, received his New Zealand counterpart Winston Peters on Thursday as he arrived in Đà Nẵng.